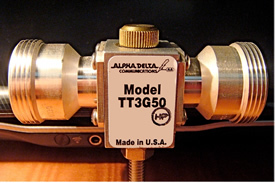 Alpha Delta Model ATT3G50DIN/HP precision 50 ohm broadband coax surge protector. 7/16DIN receptacle connectors. Broadband, low loss, high power ratings with field removable gas tube ARC-PLUG (tm) cartridge. •Rated at 2 kW RF power, assuming an antenna feed point VSWR of 2:1 or less. •Device VSWR less than 1.3:1 across frequency range. •Model 3G50HP ARC-PLUG (tm) gas tube surge discharge cartridge is ﬁeld replaceable with a twist of the knurled knob. No tools required. This design allows the surge protector itself to remain in the sealed coax cable circuit during ARC-PLUG (tm) replacement, solving a major ﬁeld maintenance problem. 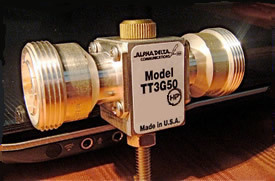 •Design of the precision constant impedance thru-line cavity, using no internal LC components, allows control voltage thru-put for antenna head-end equipment, without needing the “wire around” requirement of other, older designs. •Complete “O” ring design for the ARC-PLUG (tm) gas tube cartridge and sealed 7/16DIN connectors provide complete environmental protection for outside, external applications. • Above electrical speciﬁcations are “typical” and depend upon the integrity and application of jumper test coax cables, measurement techniques and test equipment type and calibration. •Contact sales ofﬁce for pricing and availability.